Alaska State Troopers on Wednesday released new details about a July 1 crash that led to the death of a motorcyclist, while a key witness blamed the accident on a trooper who the witness said had hit his brakes to pursue a passing speeder. The trooper's braking and whipping around led multiple cars on the Seward Highway in the lane behind the trooper to slam on their brakes and take evasive action, said Todd Helms, who was driving directly behind the trooper and said he skidded to a stop to avoid a crash. The Department of Public Safety says that vehicles were following the trooper and each other too closely on the highway. Aaron Smith, 44, of Eagle River was killed when his Harley-Davidson plowed into the back of a pickup driven by a 15-year-old who "braked hard" at a spot north of Moose Pass, the agency has said. 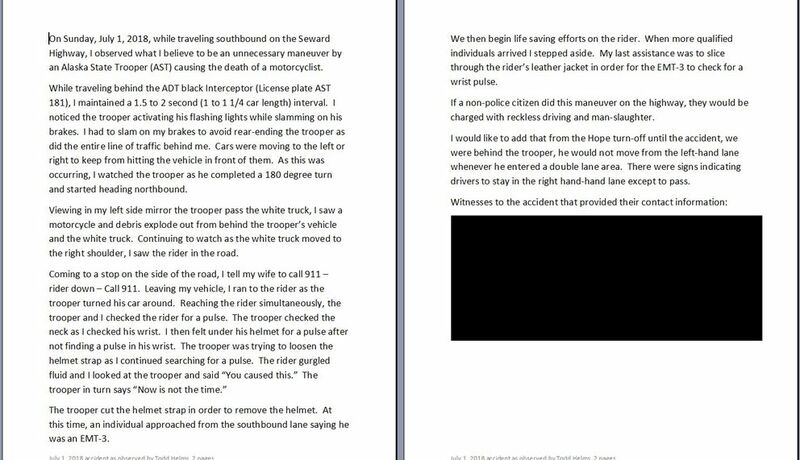 Todd Helms wrote this letter describing his account of a fatal accident July 1 on the Seward Highway. On Wednesday, Department of Public Safety spokesman Jonathon Taylor said the trooper was traveling in an unmarked patrol car just under the 65 mph speed limit when a car going the opposite direction blew past at about 90 mph. To halt the speeder, the trooper "braked slightly," flipped on his emergency lights, and traveled a considerable distance before turning, Taylor said. The motorcyclist was traveling "several cars" behind the trooper when the crash occurred, Taylor said. The case remains under investigation, Taylor said. The agency has not named the trooper who made the turn. The teen driver, from Seward, has also not been named. Taylor said the preliminary review indicates cars traveling immediately behind the cruiser were 60 to 90 feet behind one another — a previously unreleased detail — in "clear violation" of state law requiring much larger distances at highway speeds. "Preliminary investigation determined that the collision appeared to be the result of insufficient following distances between the vehicles immediately behind the trooper," Taylor said in the email. Helms, an Anchorage resident and employee with First National Bank Alaska, provided his version of events in a letter to Rep. Paul Seaton, R-Homer. Helms said he sent the letter because he wanted help getting answers about the trooper investigation. He said the agency appears to be incorrectly suggesting the teen driver is the culprit, rather than the trooper. Helms said a trooper investigator asked him questions at the scene but the agency hasn't followed up to interview him further. Helms, who tried to help the victim after the crash, said he told the investigator that the trooper was at fault. "I will go to court and die knowing it was (the trooper's) fault," Helms said Wednesday. "If you'd have pulled that stunt, you'd have been arrested with reckless driving and possibly charged with manslaughter." Helms, 56, said he was traveling directly behind the trooper in a Honda Pilot, with his wife and their 7-year-old granddaughter. The trooper was traveling more than 65 mph, "simultaneously turned on his lights and slammed his brakes," then zipped around, Helms said. "There was never any indication what he was going to do." It happened so suddenly that his wife thought the trooper had struck a moose, Helms said. "I had to slam on my brakes to avoid rear-ending the trooper as did the entire line of traffic behind me," Helms said in the letter. "Cars were moving to the left or right to keep from hitting the vehicle in front of them." In the letter, Helms said he was at least one car length behind the trooper, up to 1.25 car lengths. Helms said Wednesday that he believed that to be a safe distance, and his Honda didn't collide with the trooper's car as the trooper spun around. "I could squeeze a car my size, or larger, in between me and the trooper safely," Helms said, of his traveling distance behind the trooper. Helms said, "Where is your (the trooper's) awareness of the road before you hit your lights and slam your brakes and make that kind of a maneuver?" Under state law, a vehicle traveling 65 mph should be almost 200 feet behind the vehicle in front of it, said Taylor. That's about 13 car lengths, assuming the average car is about 15 feet, he said. Even slight decreases at that speed, close to 100 feet a second, can make it hard for motorists to safely react if they're too close to another vehicle, Taylor said. Taylor said camera footage, from the front and rear of the trooper vehicle, will not be provided while the investigation is ongoing. "Whether citations need to be issued, they are still investigating," Taylor said.